Chattels refer to “someone’s possessions, not including any houses or land that they own.” These can be items of movable personal property, such as furniture, livestock or vehicles. When accessing credit in Uganda, in most cases the borrower is required to advance collateral either in form of a title of undeveloped land or already existing real estate property. This applies to both individuals and companies accessing capital from financial institutions. So chattels open up access credit to a whole other section of society. Fernando Do Soto in his book “The Mystery of Capital” argued that in “Haiti one of the poorest countries in Latin America, the total assets of the poor were more than 150 times than all the foreign investment the country had received since its independence from France”, almost 200 years earlier. But this capital could not be utilised because of the absence of legal frameworks that recognise the value in the different types of assets. 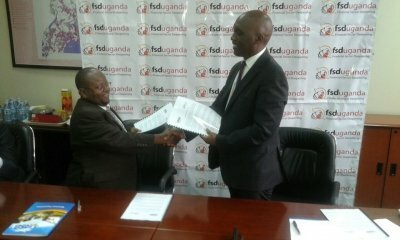 On Thursday 29 September 2016, the Financial Sector Deepening Uganda (FSDU) signed a Memorandum of Understanding (MoU) with the Uganda Registration Services Bureau (URSB) to facilitate the development of a comprehensive chattels securities legal framework that meets international best practices for secured transactions. This law provides a legal framework that will enable businesses access credit using their movable properties as collateral, which are currently very rare. This cooperation is critical to increasing access to credit by Ugandans who live on less than US$ 2 a day. According to the most recent Uganda Finscope survey, almost half (45%) of Ugandans in the lowest wealth quartile have their investments in livestock, while over one in five (21%) of the same group have their investments in produce. It is very common to find a poor person without a land title but with assets such as livestock and farm produce. Under the chattels securities law, they should use those assets as collateral to access credit, where previously a land title would have been the only possible collateral required. This law will also further strengthen consumer protection in transactions where the use of chattels as collateral has been abused, especially for vulnerable members of society. Stories are told of how someone borrows say Ushs 100,000 and uses their bicycle valued at say UGX 300,000. Instead of the lender just holding the ownership documents in custody until the borrower repays the loan, the borrowers have in most cases been required to sign away the full ownership rights to the chattel even before they default on their loan payments. This is a common practice among money lenders. This violates the borrower’s rights because there is no effective legal framework in place on chattel securities. This is still the case even after the passing of the Chattels Securities Act in 2014, which still has some gaps to be addressed. The chattels new securities legal framework has the potential of increasing access to credit of micro-enterprises, which account for more than nine out of ten (93%) of the registered businesses in Uganda. These businesses employ between one to four people. This law will unlock capital in chattels previously untapped or not effectively utilised by the poor. That will put the little assets that they do have to work, and allow them to smooth their income or invest in their businesses and help them to eventually work their own way out of poverty.